Some days, it amazes me that I get anything done. Ok, that's not strictly true. Some days it amazes me I get anything *useful* done. I am a world class procrastinator and have decades (ok, maybe two) of experience of How To Avoid Doing Meaningful Stuff. I'm not sure when it started, and I'm not even sure how it ballooned into the out of control problem it now is, but there is nothing I do better than not doing what I'm supposed to be doing. I've never been a particularly organised person. At Uni, all my essays and case work was done at the very last minute, which involves lots of staying up late and then cursing myself for being so lazy. When left to my own devices, I will fill time with the most mundane chores to get out of necessary tasks. I know I'm doing it, but I still can't stop. It's not uncommon for me to work all day, come home, and then choose to exercise for an hour JUST to give me an excuse not to type up my reports. I realise that situation could be worse. I could be sitting around doing nothing instead of working out, but the end result is the same: no work is being done. I'm not putting on any weight, though. I have a good friend who does the same job as me and he never goes home without finishing off a report from any particular day. And me? I like nothing better than starting a new week with four or five unwritten report files from the previous week staring menacingly at me every time I wander into the conservatory. The worst of it is: I feel bad about it. I will concern myself with the work I've not done because I HAD to wash those dishes or desperately needed to check my Facebook for the tenth time that day. The not doing it then fuels my worry and, with every day that goes by, more and more reports will build up. I will finally force myself to write up a couple, just so that I can sleep that night without having nightmares about them. I know the sensible answer would be, you know, to simply do the work, but I can't. Well, I probably could, but I know that I won't. It's a constant internal battle that's plagued me for as long as I can recall. It may sound odd, but it's exhausting. Yes, it really is tiring NOT doing anything of merit. I could tell you the details of every single story on my Sky News app from any given day, but that won't be of much use to me when the removal van pulls into the driveway and my house is devoid of boxed belongings, will it? I mean, I read EVERY story. More than once. I'm sometimes so bored I read the technology feed. The clock in my car is an hour fast for 6 months of the year because I don't know how to change it. I am not a woman who is interested in technology news. It's mind numbing, for the most part, but if it gets me out of work, I'm on it. I then use my newly acquired knowledge to astound LT when he comes home. After all, how could he function without knowing that Amazon is about to start delivering packages to Audi owners with Prime memberships in Munich? 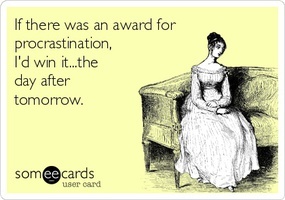 The weird thing is that I manage to justify a percentage of my procrastination in my head. And it works...for a while. I'm very much of the mindset that everything will work out in the end, but that's not always the case. I've lost count of how many times my faffing around has got me into trouble, but it seems that nothing can derail it. I've even Googled tips and tricks on how to combat the issue, but I did it when I should've been answering my business emails, so I fear it was futile.